Nissan has successfully proved that it cares about the customers ‘choice and preferences, we can see this commitment in 2013 Nissan JUKE NISMO that made a fantastic debut at Chicago Auto Show. Success of NISMO brand compelled Nissan to expand this line with some other stylish and groundbreaking models. Nissan fully utilized this platform (Chicago Auto Show) and informed attendees about the arrival of 2014 370Z NSIMO with its impressive Preview. 2014 370Z NISMO is powered by 3.7L DOHC V6 engine, its lift control and Variable Valve Event System produces Horsepower of 350hp and Torque of 276 lb-ft. Apart from this effective engine management system, H Figure Exhaust System Design support and ensures the efficient working of engine. Moreover, Nissan has also employed SynchroRev Match Technology in 2014 NISMO that will help the driver to adjust the speed of engine automatically according to position of gears. 6-Speed Manual Transmission is standard on all the models. Engineers at Nissan Manufacturing Plant are leaving no stone unturned to present it as one of the best vehicle that will be released from manufacturing house of Nissan. Exterior is extremely stylish and based on firm body structure. 19-inch RAYS Forged Aluminum Alloy Wheels are standard on all the models; Gun Metallic Finishing of these Wheels adds another element of style in its exterior. 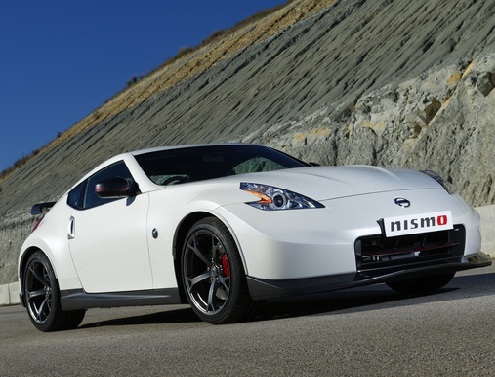 2014 370Z NISMO will land at Nissan dealers in this summer.